We offer high quality stainless steel automotive restoration body bolt, chassis and suspension bolt and fastener kits for a wide range of makes and models, from classic cars and trucks to muscle cars, late model trucks, Jeeps, Corvettes and even Volkswagens! 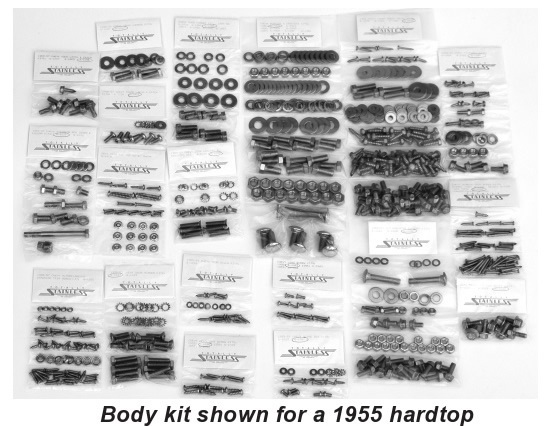 These kits include virtually every nut, bolt, screw and washer needed to correctly assemble your classic car, truck or hot rod. Body Bolt Kits These bumper to bumper bolt kits contain individually labeled component fastener kits, taking the guess work out of the assembly process, and are offered in several bolt styles. 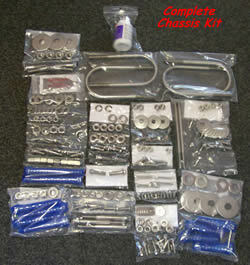 Chassis Bolt Kits and Suspension Kits are available to complement the drivetrain and body kits. 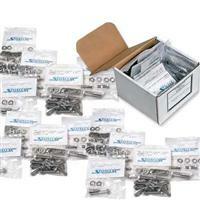 These automotive bolt and fastener kits contain the first large size, high-strength bolts for suspensions. Where appropriate, the kits contain high- strength U-bolts with the correct tall nuts. Engine Bolt Kits These kits are available for most U.S. V-8s and many 6-cylinder engines and include all the correct bolts and washers for the distributor, fuel pump, intake, oil pan, thermostat, timing cover, water pump and valve covers. The black stainless is achieved by applying a permanent high tech powder coating with Teflon so that anti seize is not required on these black fasteners. This coating is .4 mils thick.